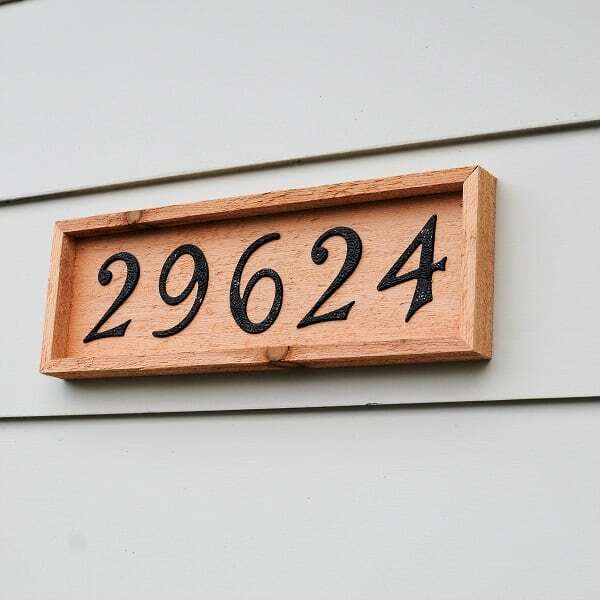 A house number plaque is a quick, easy, and inexpensive way to add some serious style to the exterior of your home! 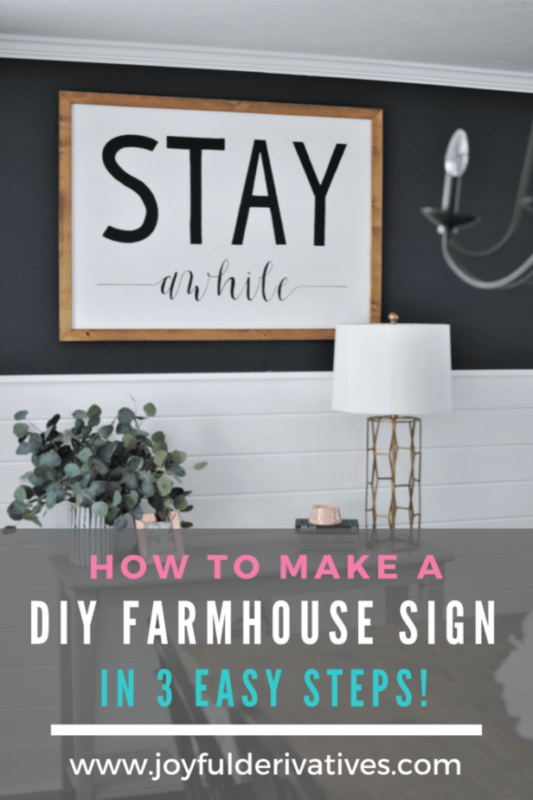 This step-by-step DIY tutorial will show you exactly how to make a rustic house number plaque for your home. We’ve had our basic black house numbers next to our porch light since we moved in two years ago, but I’ve always wanted to move them to the front of our house next to the garage. 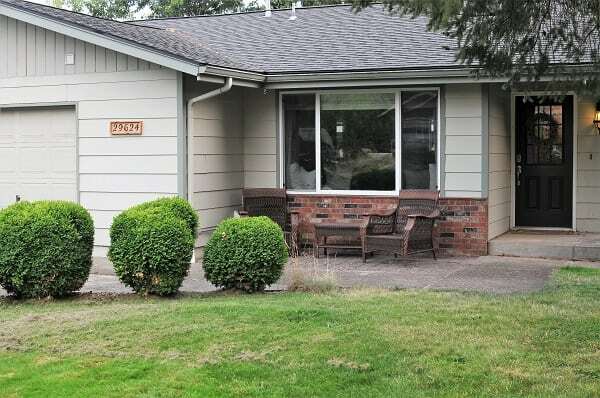 There’s an awkwardly large section of siding between the garage door and the corner of the house that just needs something. So, I reused my existing black house numbers, bought a single 6′ board of cedar fencing and viola! An upcycled rustic house number plaque for less than $3! 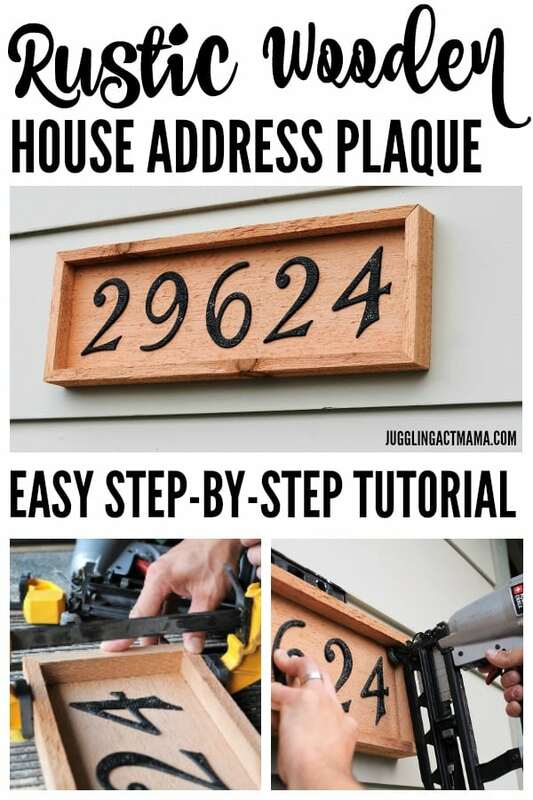 In today’s tutorial, I’m going to show you exactly how to build yourself a beautiful rustic house number plaque. This project is super simple and takes less than an hour to complete! STEP 1 & 2: Cut your inside board and attach the numbers. I didn’t even measure for this step! I simply laid my house numbers out on one end of my cedar board, got a feel for a width I liked, marked it with a pen, and cut it on the chop saw. 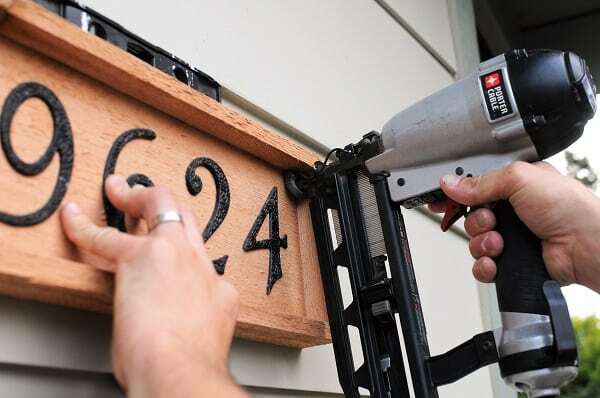 Once you have your inside board cut to size, lay your house numbers out on it, space them out evenly, and nail them in. Because we have 5 numbers in our address, I started by centering the “6” both horizontally and vertically and then spaced out the others accordingly. If you wanted to, you could also measure the height of your numbers and then use painter’s tape to mark the top and bottom of them across the board as a reference. STEP 3: Cut and install your frame. 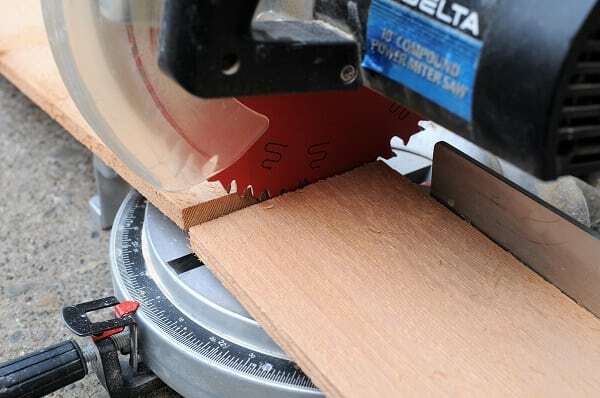 Using a table saw, rip down the remainder of your 6′ cedar board into a piece that’s 1 1/4″ wide. 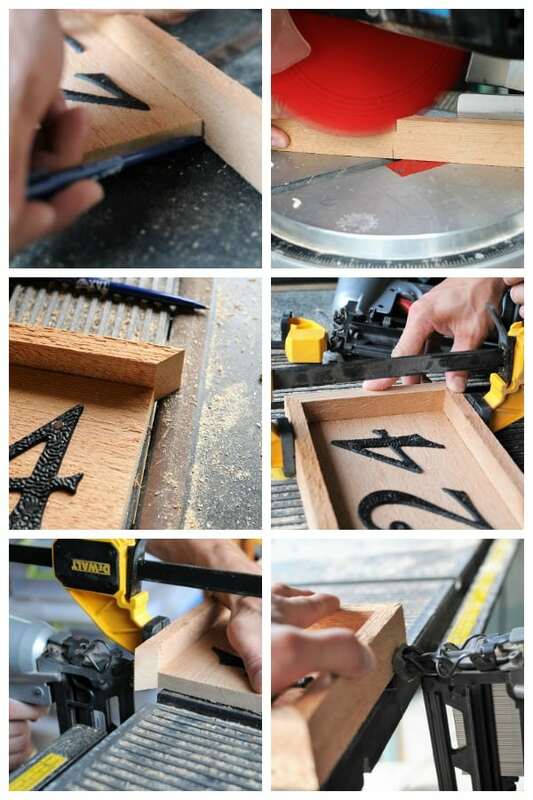 Cut mitered ends for a frame that fits around your inside board and install it using clamps and a nail gun. STEP 4: Install on your house. 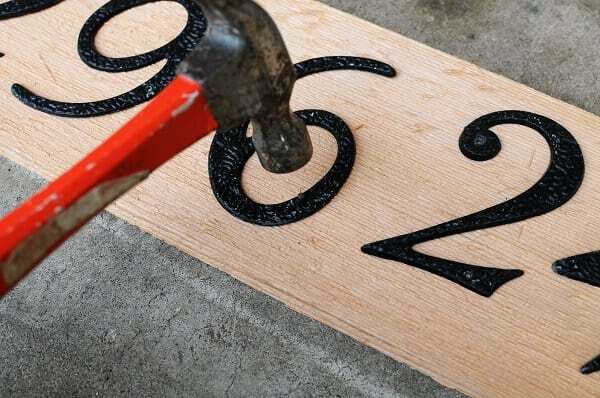 Finally, the last step is to nail your beautiful, house number plaque onto your house! We simply used our nail gun and nailed in into the siding. So, what do you think of our new rustic house number plaque ? I love the look of the cedar against our sage green siding! If you want less rustic and more modern, use a sanded, dark-stained wood. For a beachy coastal style, paint the wood white and distress it a bit. I hope you have fun with this DIY project! Not only is it easy (taking less than an hour to make), but it’s also extremely affordable (at less than $3!) It’s really a great way to add style to the exterior of your home. I just wanted to say a big thank you to Ang for letting me share this tutorial with you! I love teaching non-designers simple and affordable ways to create a home they love to spend time in and are proud to share with others. On my blog, Joyful Derivatives, I write tutorials to teach people how to decorate or update their home at low costs, give tips on easy and inexpensive ways to decorate your home and share my passion for home design through room makeovers and home renovation projects. 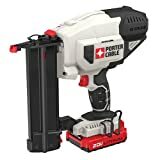 A few of my most popular posts are “The Best Home Decor to Shop for at Thrift Stores” and “Magnolia Paints Color Matched to Behr“. 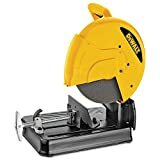 Seeing how our house sits back from the road a ways, we need to make this to mount on our mailbox post so that emergency vehicles can spot our address easier. What a great gift this would make for someone / new neighbor, family members, etc. I hadn’t thought of it as a gift, but yes, what a lovely idea for a housewarming!